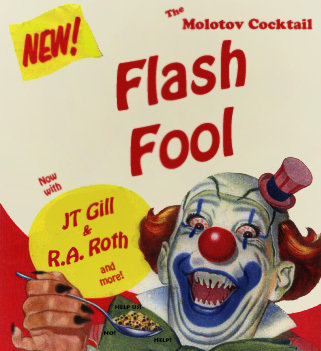 We’re happy to present the scrumptious morsels of our Flash Fool mega-issue—a whole issue designed to pull the rug out from under you! This is our third prize-winners issue and second mega-issue (featuring 10 prize-winners and honorable mentions). We had another great turnout for this contest, and the selection process was perhaps the most grueling we’ve had to endure. All you amazing writers with all your imaginative twists made it awfully hard on us to narrow this contest down. See our Results page for the shout-outs we gave to the close-but-no-cigar entries that barely missed squeaking into the final cut. And the biggest twist of all? The same writer snagged both 2nd and 3rd place honors! That’s why we read ’em blind, folks.